NOTE: This repair was done on my 1994 C280. However it may work for other years/models. I cannot guarantee 100% accuracy nor can I be liable for any damage one can cause to his or her car or self. Please be EXTREMELY careful with handling air bags, as they can go off and severly injure you!! This how-to will cover removal of the steering wheel. I believe the process is nearly identical for all years, however there may be a few different things here and there. Step 1: Disconnect the Negative Terminal of the battery. The battery is located in the trunk on most models. It is on the right side of the car. 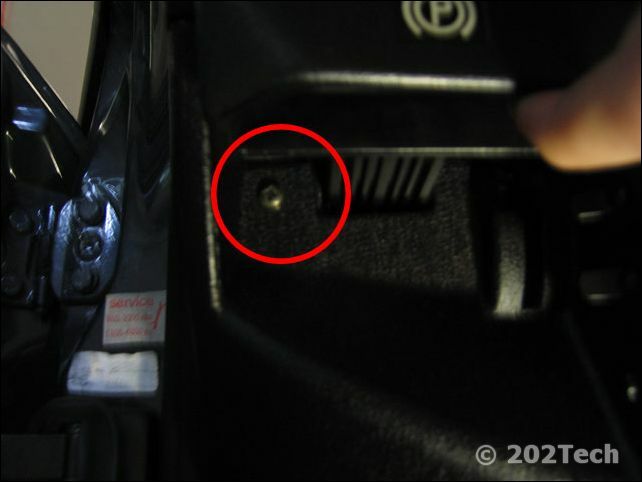 The bolt is 13mm to disconnect the negative terminal. Step 2: Remove the lower knee-bolster from the driver's side. 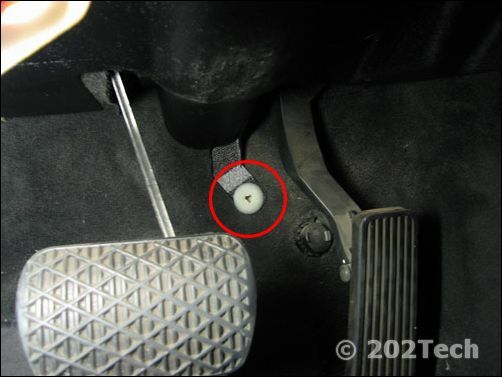 Removal of this is to give enough clearance to remove the Torx screws from behind the steering wheel. It may not be necessary, however it my also be helpful for removing the cluster itself by pressing it out from the back. Start by unbolting and unscrewing the fasteners. I believe they are 8mm hex bolts. 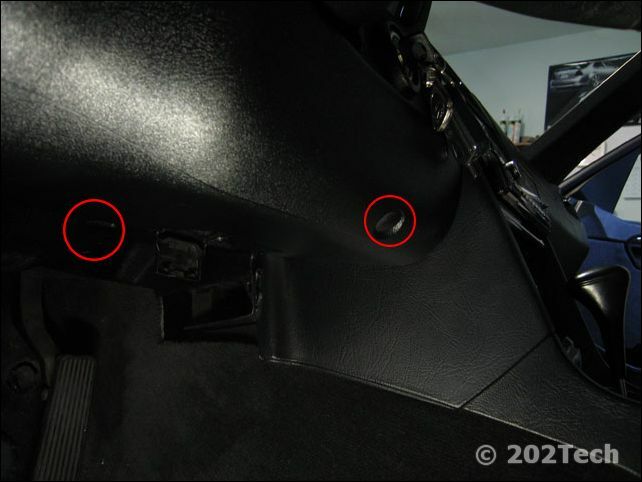 There is also a Philip's head screw behind the E-brake release lever and the hood release lever. One of the 8mm bolts is covered by a trim piece that can be popped out with a small screwdriver, or a finger nail even. The pictures below indicate where the screws and bolts are. Once removed, the wires will probably not need to be removed. You can just let it sit on the floorboard as you remove the steering wheel. Step 3: Unscrew the airbag unit from the car. BE VERY CAUTIOUS WHEN HANDLING THE AIRBAG UNIT! Start by unscrewing the two Torx screws on the back of the steering wheel. The Torx driver that I used is size T-30. 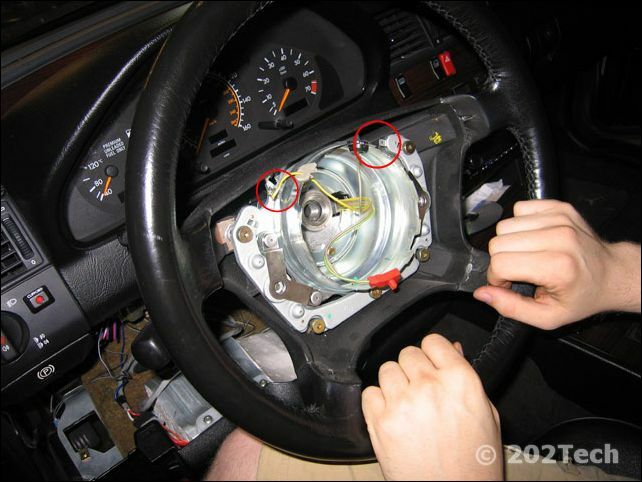 Step 4: Disconnect the airbag activation wires from the back of the airbag. The red connector needs to be removed. VERY CAREFULLY, use a small wedge or a big flat (slotted) screwdriver to gently pry up the plug. 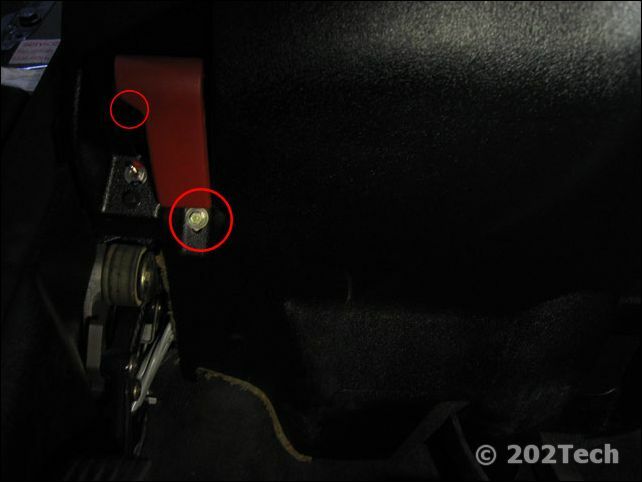 Step 5: Now that the scary part is out of the way, Take a look at the big bolt that holds the steering wheel on. Removing it will require a big breaker bar, and two people. The bolt is a 10mm Allen driver. I used a 4 inch extension on my ratchet, and use a large torque wrench to take it off. It is necessary to have two people because one person needs to turn the wrench, and the other needs to hold the steering wheel in place. It is NOT recommended to torque on the steering wheel lock as that would likely break it. Have the other person hold the wheel in place. 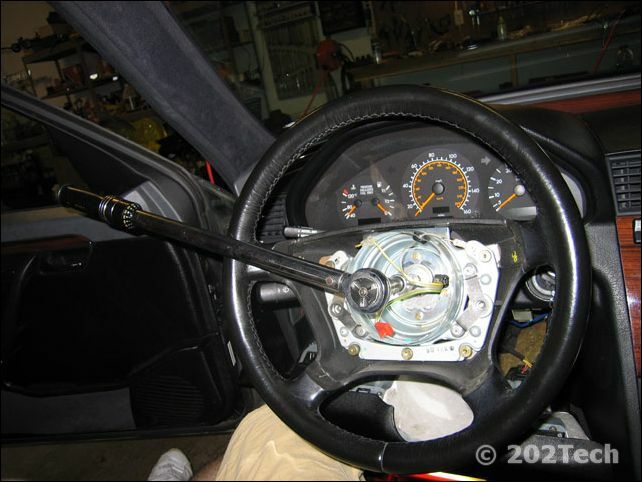 Step 6: Once the bolt is removed, it is a good idea to set the steering wheel to be completely straight, and where the wheels point forward. 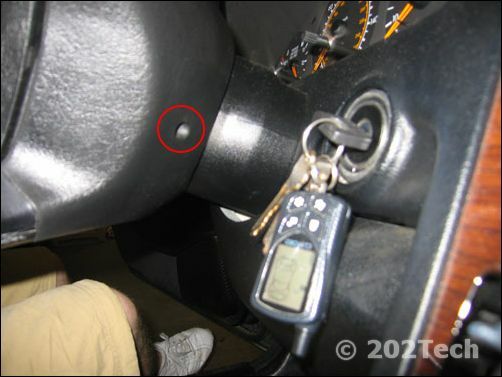 Also, mark where the spline shaft and the steering wheel meet before you remove the wheel if it isn't already marked. 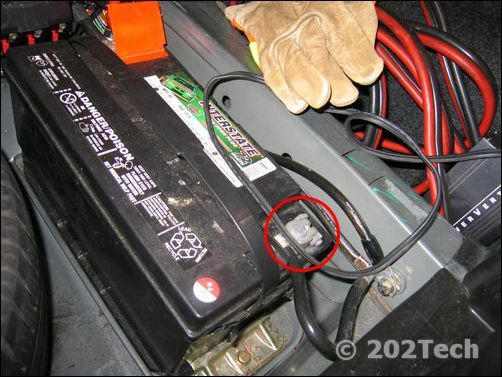 Disconnect the two wires circled below and then simply pull straight out to remove the wheel. Make sure not to turn the clock spring where the wheel and the column meet. Torque the steering shaft bolt to 80nm or 59 ft-lbs of torque. © Copyright. Martin Kosonen. 2010.